Jeff Shaw: April 26th and 27th! Jeff Shaw is a stand-up comic. His writing is marked both by idealism and humanity. His stimulating satire is often infused with a singular poetic beauty. More important, he looks like Rod Stewart. Over the past three decades, Jeff has performed nearly 9,000 shows across North America and the Caribbean, including a residency in Las Vegas. 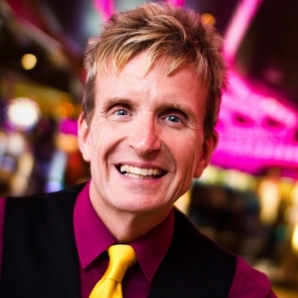 In 2009, Jeff helped launch the Punchliner Comedy Club chain for Carnival Cruise Line, where he’s known as Jeff “the Fun Dude,” and was the club manager and house MC on the Carnival Dream. In the 1990s, Jeff wrote popular comedic essays and feature stories for Cleveland’s Scene Magazine, Buffalo’s Art Voice, and the online comedy publication SHECKY! Magazine. Jeff is also a former staff writer for Cleveland’s American Greetings Corporation, responsible for hundreds of funny greeting cards and novelty items for the company’s Alternative Cards Department. Don Reese: April 19th and 20th! → ← Chris Barnes: May 3rd and 4th! We are Kenosha’s premier comedy showcase with professional stand up comics every weekend. Fridays at 8p.m. and Saturdays at 7:00 & 9:00 p.m.